When we open history books that discuss modern – but not very recent – history, they are usually filled with black-and white photos, as for many years taking color photos required much time and special equipment. 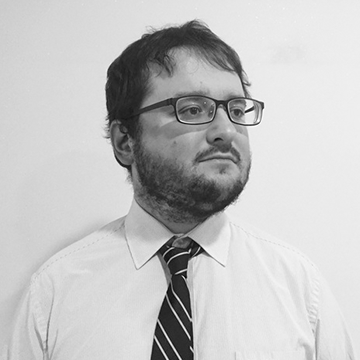 One of the consequences of this is that history, in minds of many people, becomes black and white too. We do understand that World War II was not fought by gray-skinned soldiers wearing gray uniforms under a gray sky – but in our subconscious minds many people have exactly this image. 1) I’m not a pro and never received any special education regarding colorization. 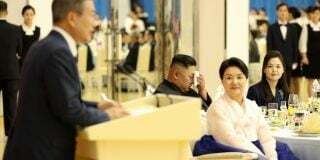 Nevertheless, I hope that these pictures look realistic and will relay the message that these North Koreans lived on the same planet that we do and were, in most regards, not very different from us. 2) 100 percent accurate color restoration is never possible. However, I’ve tried my best, consulting various encyclopedias and surviving contemporary color photos to make the colorization as close to reality as possible. This photo is dated October 14, 1945. 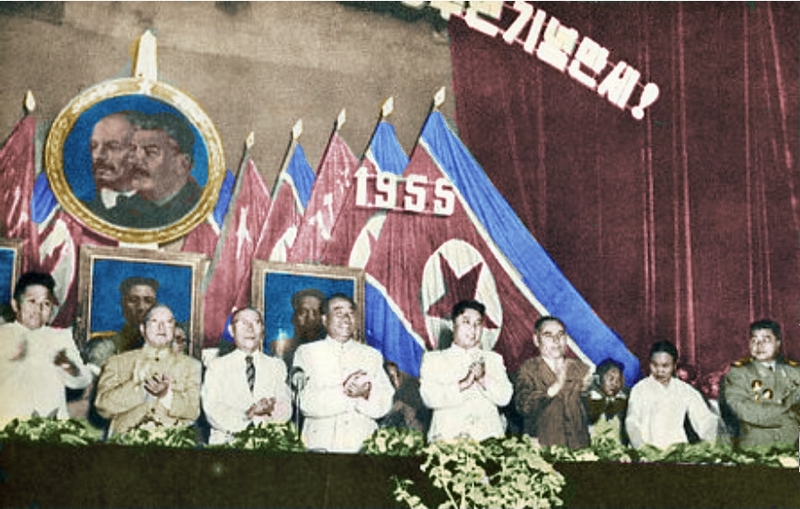 Kim Il Sung is shown to the public for the first time during a rally in Pyongyang. Kim proudly stands with a Soviet Order of Military Red Banner on its chest. 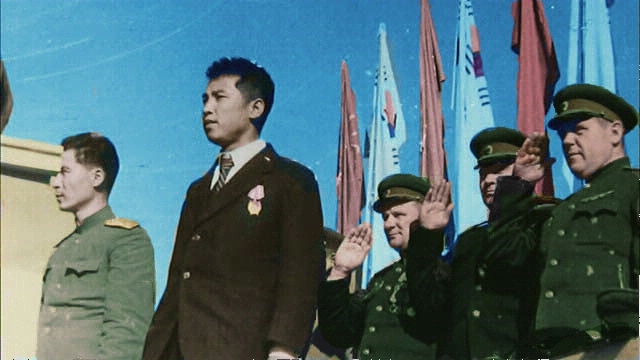 The Korean standing next to him is Major Mikhail Khan, briefly considered by the Soviets as a potential ruler of communist Korea. 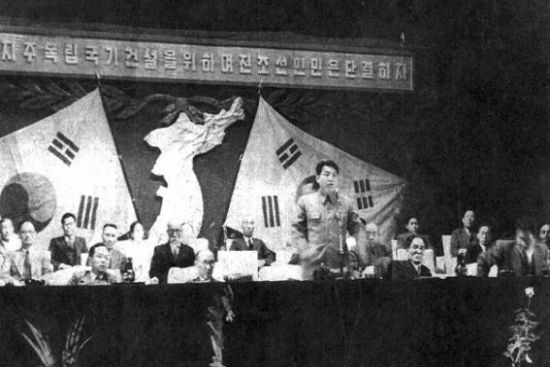 This photo comes from November 3, 1945, when the Democratic Party of Korea was formed. For a very short time is was a real opposition force, before it was transformed into a mere puppet of the communists. 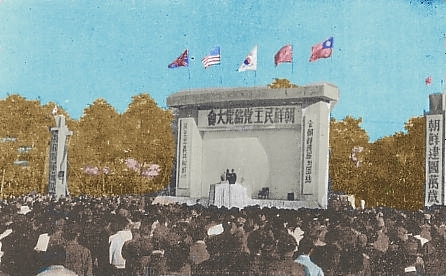 Here, in April 1948, Kim Il Sung speaks at the joint North-South meeting. That was of the last major events when Taegukgi, the Korean Flag of Great Extremes and the flag currently used in South Korea, was still hoisted in Pyongyang. 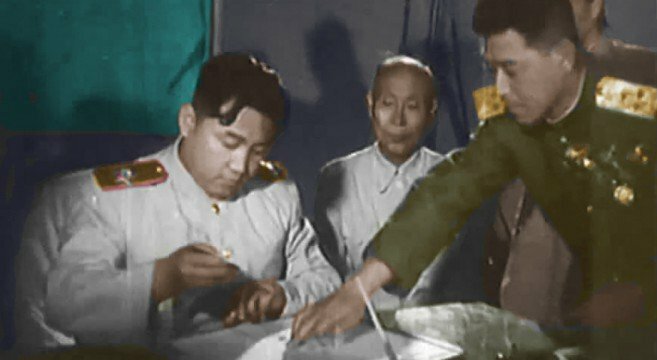 A few seconds prior to when this picture was taken, on July 10, 1948, the DPRK Constitution formally came in force in northern Korea. 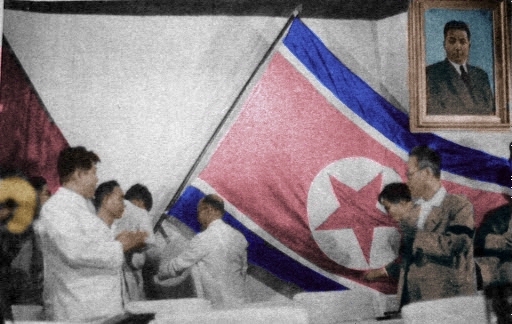 The new flag of the DPRK is hoisted for the first time by Kim Tu Bong. 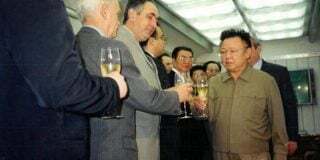 Although now the creation of the DPRK is formally calculated from the formation of the first Cabinet of Ministers on September 9, 1948, it was on July 10 when the process of the division of Korea became irreversible and North Korea was truly born. 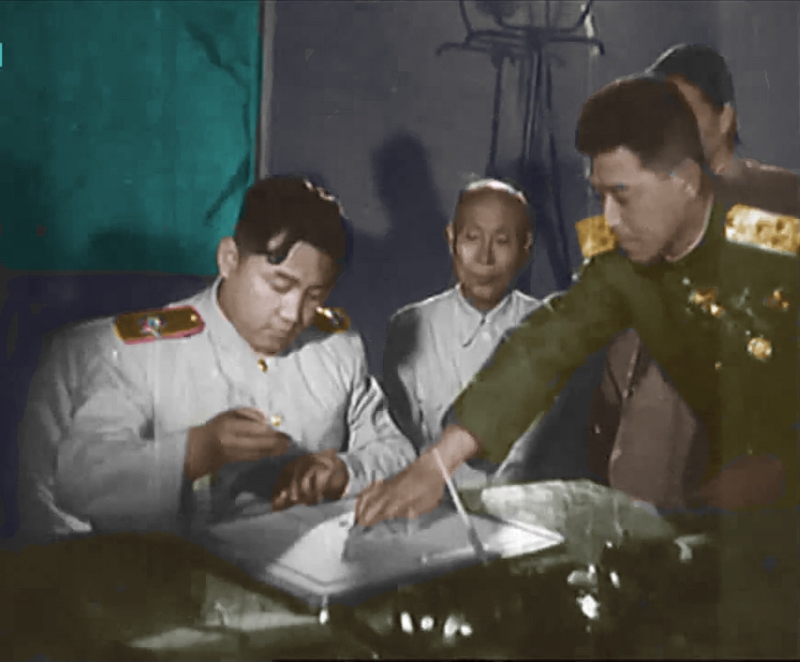 After the Armistice agreement was singed in Panmunjom, Kim Il Sung, wearing his marshal’s uniform, signs it in Pyongyang. Kim Tu Bong (chairman of the Presidium of the Supreme People’s Assembly, purged in 1958) is sitting next to him. The General giving Kim the document is Nam Il (aka Yakov Petrovich Nam), who signed it in Panmunjom. Finally, the woman behind Nam Il is Pak Chong Ae (aka Vera Tsoi), Chairman of the Central Committee of the Union of Democratic Women. In a few decades she would be purged as well. 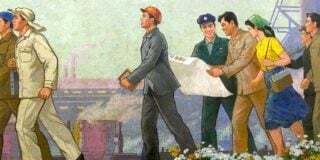 It took a few days after the end of the war for North Korean authorities to realize that the armistice should be portrayed as a great victory of the DPRK against the American and British imperialists. 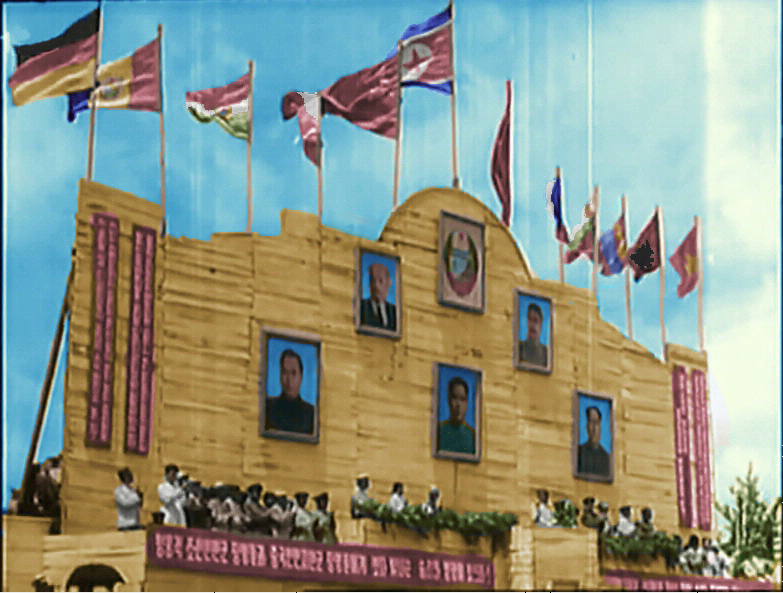 Here is a colorized screenshot of a mass rally in Pyongyang with flags of socialist countries being hoisted (Yugoslavia, under the ardently independent Josip Broz Tito, was already not considered a socialist country by the USSR and its allies). This pictures is dated 1955. 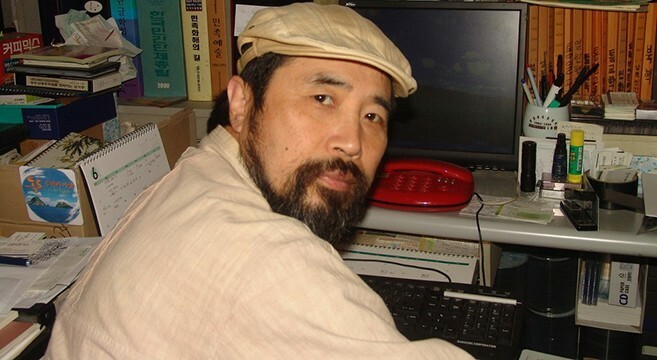 Ten years had passed after the DPRK came to existence. In two years, Vice Marshal Choe Yong Gon (the rightmost), the DPRK’s second-in-command, would be stripped of rank during some very murky circumstances. 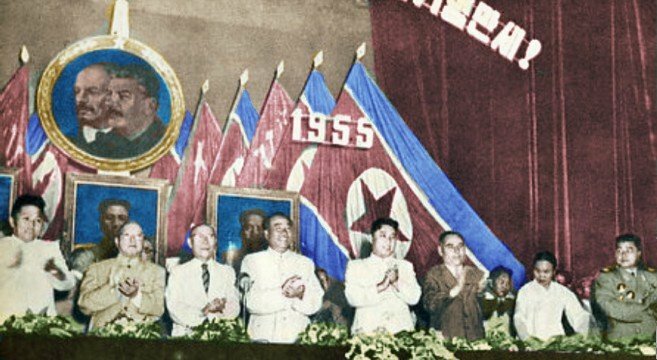 Soviet dominance is still clear, but only in a year will the two countries clash for the first time and the DPRK will start to move away from Moscow – until, in 1967, Kim Il Sung will establish a new ideology, based on worshipping him, with little place for Lenin, Stalin and the Soviet Union. 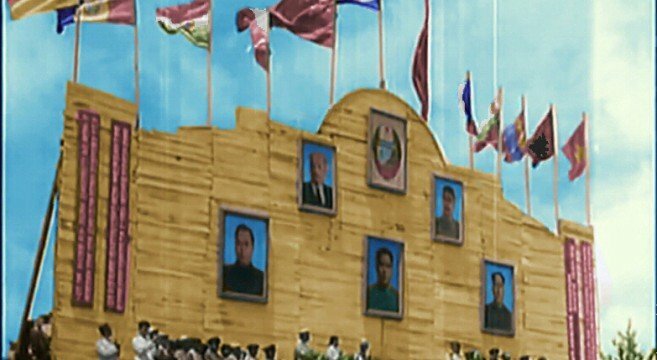 Living in North Korea may be seen as living in a black and white movie – but, in fact, life under dictatorship may still be a rather colorful thing. I hope that these pictures will served as a reminder that all North Koreans were not some book characters, but real human beings, who lived in a real world full of colors – just like us. Subscribe to read the remaining 758 words of this article.